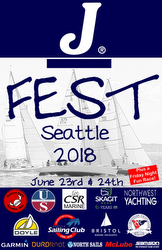 (Seattle, WA)- The 2018 edition of the J/FEST Northwest Regatta will be hosted by Corinthian YC Seattle and J/Boats Northwest for forty-seven teams that include a PHRF class, and one-design fleets of J/24s, J/80s, J/30s, J/97E’s, J/105s, and J/109s. For 26 years, J/Fest NW produced some of the best racing and after-race socializing available on the planet. This year it is a two-day regatta (with a Friday night PHRF fun race) open to all J/Boats owners and crew. The on-the-water activities are hosted by Sail Northwest and CYC Seattle. Shoreside activities will be at the CYC Seattle Shilshole clubhouse Saturday and Sunday. Saturday evening’s dinner and door prize extravaganza is always a sellout. So, come on down and join us for what Northwest Yachting Magazine called “the most looked forward to regatta of the year”- J/FEST Northwest. The eight-boat PHRF Division includes a fun, eclectic mix of J’s from across the spectrum of time. At the top end of the spectrum are the sisterships, the J/46 CLAYMORE (Michael Johnston) and the J/44 ASYLUM (Kyle Caldwell and Jamie Thomas). At the other end of the scale is the J/32 DRAGONFLY (Anice & Alan Flesher). The eleven-boat J/24 class includes some local, notable, celebrities, like TREMENDOUS SLOUCH (Scott Milne) and TUNDRA ROSE (Carl Sheath). With eight J/80s, it is the largest turnout ever for this class in the PNW. Some notable teams are Bryan Rhodes’ CRAZY IVAN and Mike Poole’s JOLLY GREEN (J/80 #1!!). 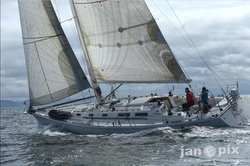 The J/97E class has Rocky Smith’s INDIGO HORIZONTAL and Eric Barlow’s IRIE. The J/30 class includes Cindy Gossett’s OUTLAW and Jim Bottle’s CELEBRATION. 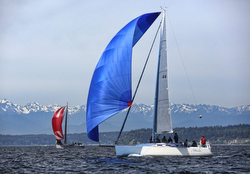 The always-popular J/105 class of eleven teams has just about all the movers and shakers in the PNW participating. In fact, it’s like a class reunion for 105-lovers! Amongst the 105 cognoscenti are Jim Geros’ LAST TANGO; Tom Kerr’s CORVO 105; Eric Hopper, Matt Davis, Doug Scherk’s FREE BOWL OF SOUP from Portland, Oregon; Chris Phoenix’s JADED; Jerry Diercks’ DELIRIUM; and Ryan Porter’s AVALANCHE. Similarly, the five J/109s will be sure to have spirited racing for the Pacific NW Championship Trophy! Top contenders will certainly include Stu Burnell’s TANTIVY and Jerry Woodfield’s SHADA. For more J/Fest Northwest Regatta sailing information Add to Flipboard Magazine.